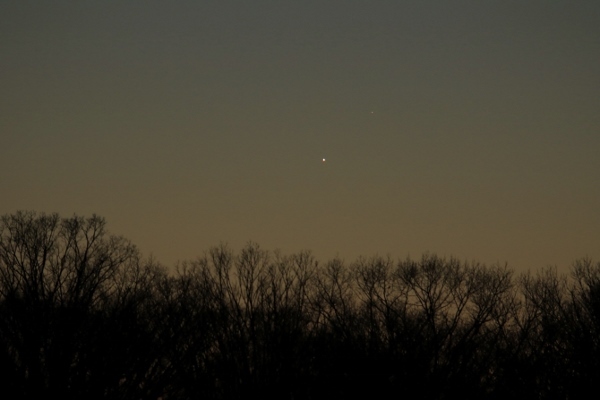 The first sighting of the second elongation for 2019 was on March 27, 2019 from Swede Run in Moorestown, NJ. It was initially sighted at 6:19 am EDT with 15x56 binoculars, but not with unaided eyes since the relatively dim planet (magnitude +1.5, just 19% illuminated) was in relatively bright twilight (sunrise at 6:52 am). Although Mercury was more than 20° from the sun, the ecliptic was at a shallow 28° angle to the horizon at the time, so it was only at 3.0° altitude (98° azimuth). The second sighting of the second elongation for 2019 was on April 3, 2019 from Swede Run in Moorestown, NJ. It was initially sighted at 6:08 am EDT with 15x56 binoculars, but not easily seen and not a hint with unaided eyes since the not-bright planet (magnitude +0.76, 34% illuminated) was in fairly bright twilight (sunrise at 6:41 am). Although Mercury was almost 26° from the sun, the ecliptic was at a shallow 27° angle to the horizon at the time, so it was only at 4.0° altitude (100° azimuth). 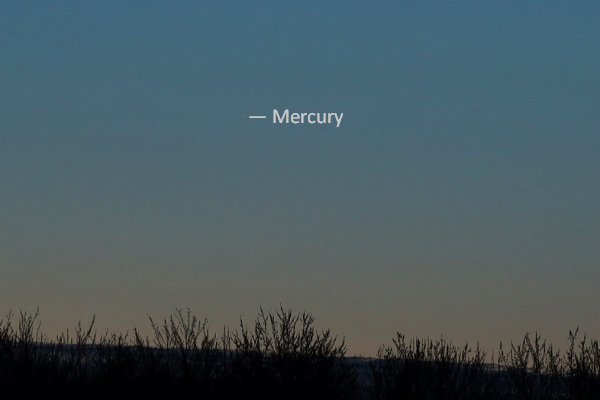 Mercury at 6:16 am EDT on April 3, 2019. Taken with a Canon EOS RP mirrorless digital camera + Canon 100 f/2.8L macro lens, then cropped to 25% of the original size for a field 5.2° wide x 3.5° high. Exposed 1/80 second at f/2.8, ISO 400, daylight white balance. The first sighting of the first elongation for 2019 was on February 16, 2019 from the Maple Shade, NJ, baseball field complex. It was initially sighted at 6:15 pm EST with 15x56 binoculars, and then immediately seen with unaided eyes since it was fairly bright at magnitude -1.1 in the middle-twilight sky (sunset was at 5:37 pm). At the time, Mercury was at 5.0° altitude and 0.4° from Lambda Aquarii (Hydor). Mercury and Lambda Aquarii (above-right of Mercury) at 6:24 pm EST on February 16, 2019. Taken with a Canon 7D Mk II + Tamron 150-600 mm f/5-6.3 zoom at 400 mm (3.1° x 2.1° field). Exposed 1/3 second at f/5.6, ISO 800, daylight white balance. The second sighting of the first elongation for 2019 was on February 25, 2019 from the Maple Shade, NJ, baseball field complex. Mercury was initially sighted at 6:22 pm EST with with unaided eyes through the car window. It was still fairly bright at magnitude -0.5 in the middle-twilight sky (sunset was at 5:47 pm). At the time, Mercury was at 10.3° altitude. Subsequently, Mars was sighted with unaided eyes about 6:30 pm at 48° altitude, then dropping down 8° from there, Uranus was seen with 15x56 binoculars. Here's an observing report, which includes the baseball field session as well a session at Carranza Field later that night. The third sighting of the first elongation for 2019 was on March 4, 2019 from the Maple Shade, NJ, baseball field complex. Mercury was initially sighted at 6:22 pm EST with with 15x56 binoculars. It was at 9.9° altitude and had dimmed to magnitude +0.9. It was not evident with unaided eyes at the time in twilight (astronomical twilight would end at 7:25 pm). I then set up my 80 mm, f/6 apo refractor and at 6:30 pm, was able to discern Mercury's 22% illuminated crescent with a 4.7 mm eyepiece (102x), 8.4° altitude. Seeing was poor, and there was significant atmospheric chromatic aberration, so it was more like a colorful, woozy horizontal banana rather than a crisp crescent. By 6:35 pm, 7.4° altitude, I was able to see Mercury with unaided eyes, although it was much dimmer than the previous two sightings. I last saw it at 6:50 pm, 4.6° altitude, after I packed up the scope. Also about 6:50 pm, I was also able to see Mars with unaided eyes, and with 15x56 binoculars, Uranus about 12.6° below Mars. However, I didn't use Mars to find Uranus. Instead, I followed Hamal and Sheratan in Aries down to Eta Psc, then over to Omicron Psc, then up to Uranus. I was also able to spot M31 by swinging right from Aries to Mirach (Beta And) then on to M31. The current sighting streak is now 53 elongations in a row, starting in January 2011, which includes eight complete calendar years of six or seven elongations each. The years 2011, 2015 and 2018 each had seven (7) elongations, while 2012, 2013, 2014, 2016 and 2017 each had six (6). 2019 will have six (6). Click here for previous sightings. The purpose of this ongoing effort is not to set some sort of record, especially since I have no idea what sort of record might exist, but to demonstrate that locating and seeing Mercury is not nearly as difficult as many suppose. It just takes some planning and a little effort, although circumstances make some elongations easy and some difficult.